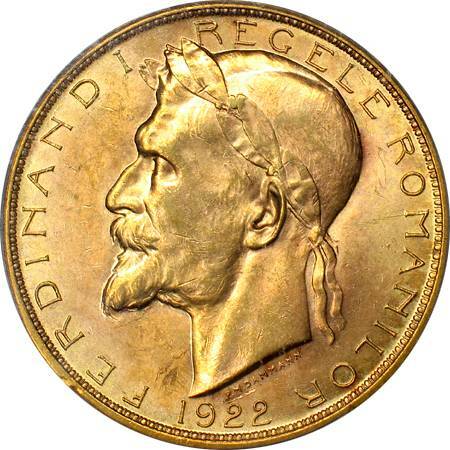 meaning HOMELAND AND MY RIGHT effigy of the king crowned with a laurel wreath, facing left (or right in heraldic perspective), year 1922 and inscription "FERDINAND I REGELE ROMANILOR" meaning "FERDINAND I KING OF ROMANIANS", outer pearl circle. Under the effigy's neck lies inscription P. M. DAMMANN, the engraver's name. 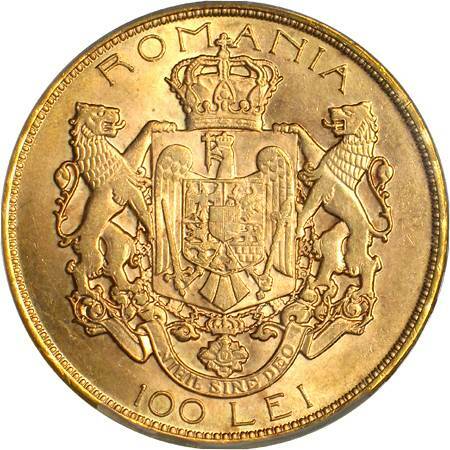 Struck in Great Britain at London Royal Mint, in 1928 or 1929 (after Octavian Iliescu and Paul Radovici, Monetele României, 2004), although antedated in 1922. The decree for the issuing of these coins was published in the Official Gazette on June 4th 1927. King Ferdinand died on July 20th the same year. The coin pictured here belongs to a four coin set of 20, 25, 50 and 100 lei. 20 and 100 lei share common design, the same for 25 and 50. The entire set was engraved by the renowned French artist Paul Marcel Dammann (1885 - 1939). The catalog values of king Ferdinand gold coins indicate that a lot of them were not released. Mr. J. M. suggests that a large part of the mintage was melted, maybe to strike other coins. The coins were issued to celebrate the fifth anniversary of the coronation of Ferdinand I and Mary as sovereigns of the now entire Great Romania. Through the three Unions of 1918 Romania became again wholly complete. The Romanians had been brought together by Michael the Brave for the first time in 1600, that being the reason for which Romanians called World War I the Nation Recompletion War. The October 1922 coronation took place at Alba Iulia, in the heart of Transylvania, just like it did the first time in 1600 to add deepest signification. The war victoriously brought to its end, king Ferdinand was depicted laureate.